Cavity preparations for composite restorations and small amalgams. Partial or complete removal of composite restorations. Re-bonding repairs of existing composite, metal and porcelain substrate restorations. 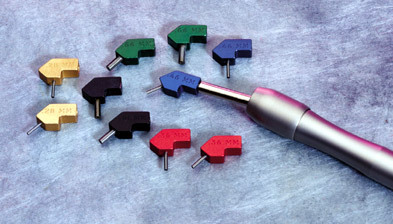 Refining and smoothing the line angles of preparations carried out with a conventional high speed hand-piece. Removal of organic plugs from occlusal pit and fissures in preparation for occlusal sealants. Removal of surface stains and pellicle from the facial surface of teeth to be bleached for aesthetic whitening. Prophylaxis. CAUTION: use only soda bicarbonate for this procedure. Satinise metallic restorations to check for interference or occlusion. Cleaning of cement from a displaced crown before re-cementation. Etching of the inside of restorations, existing substrates and posts before their repair, re-cementation or bonding.Carving of occlusal anatomy in pre-existing or new porcelain restorations before final firing or polish. 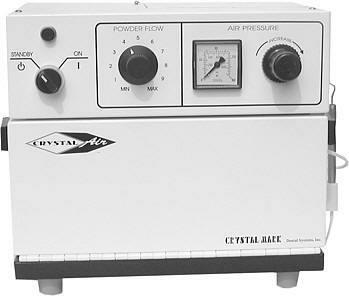 The manufacturers of the UltraLow, Crystal Mark dds. is proud to announce an engineering breakthrough with the introduction of their patented Air Abrasion Resistant Mirror. 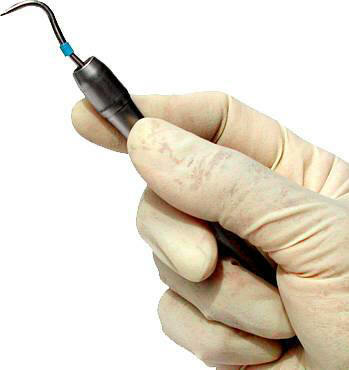 This proprietary technique allows the mirrors to resist the indirect blast of 27 micron aluminium oxide air abrasion particle stream; which would obliterate the surface of a conventional intraoral mirror. The mirror housings are of gold plated stainless steel and are fully autoclavable. In clinical use, the mirror has proved to maintain its reflective integrity through hundreds of air abrasion procedures.